Are you planning on having all of your friends over to celebrate National Blueberry Cheesecake Day? 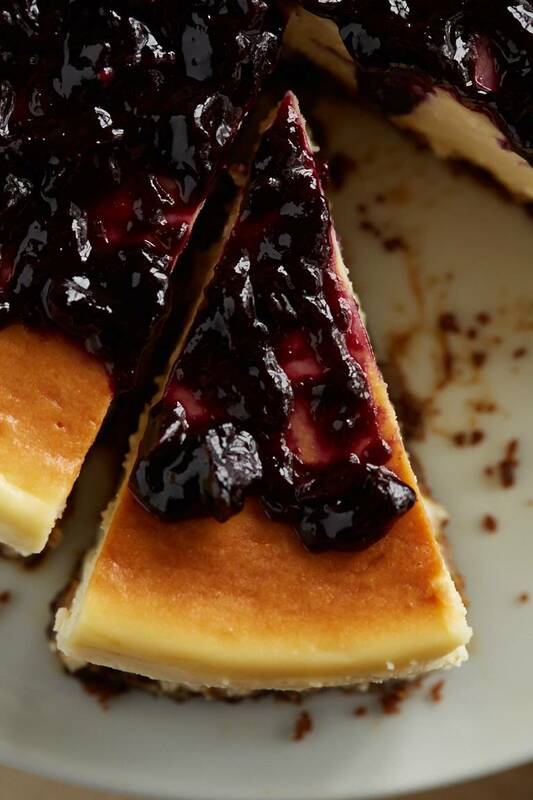 Try this recipe that makes 2 cheesecakes with blueberry compote topping. The recipe is below. For the compote: Bring all of the ingredients to a simmer in a medium saucepan. Cook until thickened, about 15 minutes. Remove the cinnamon stick, let cool, and then refrigerate. Combine the gingersnap crumbs and the butter in a small bowl. Divide the mixture between the bottoms of two 9-inch spring form pans. Bake for 10 minutes. Remove and let cool. Stir the ricotta, sugar, salt, and zest together in an extra-large mixing bowl. Lightly beat the eggs and the vanilla together in a medium bowl, and then gradually add to the ricotta mixture. Stir in the mascarpone. Divide the batter between the two pans. Bake in water baths, filling with water to come about halfway up the pans, until the top is a golden brown and the cheesecakes are cooked through, 1 hour 15 minutes to 1 ½ hours. Carefully remove the pans from the oven. If necessary, remove some of the water from the water bath before moving. Let cool in the water for about 15 minutes. Then, carefully transfer the pans to cooling racks and cool completely. Refrigerate until cold. Serve slices of the cheesecake with a generous tablespoon of the sauce spooned over the top or on the side. Whisk the buttermilk and the cream together in a medium nonreactive stockpot and attach a candy/deep-fry thermometer to the side. Heat over medium heat without stirring, until the mixture reaches 190-200˚F/87.7 to 93.3˚C. Remove from the heat and let sit for 30 minutes. Line a large, fine-mesh strainer or a colander with a few layers of cheesecloth and place over a large bowl (to catch the whey). Using a slotted spoon carefully transfer the ricotta to the strainer. With a spatula, gently move the cheese as needed to remove any excess liquid. Fold and tie the cheesecloth and tie it. Hang the cheese in the cloth to drain for at least 30 minutes.